Houzz is an online community for Architects, interior designers, and home enthusiasts that highlights cool photos, articles and product recommendations for any house-related items. 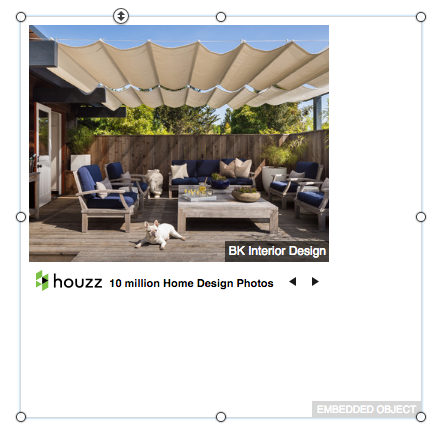 You can use the Houzz embed code to highlight different articles or photos right within your PageCloud site. You can easily embed different Houzz widgets right into your PageCloud site to showoff different images and stories. To start, head to Houzz Widget builder to create your widget and copy the embed code they provide. Next, head to your PageCloud site where you'd like the widget to appear and paste the embed code using the CMD+V (on Mac) or CTRL+V (on Windows) shortcut keys. You will see your Houzz widget object appear and allow you to arrange it on the screen as you like. Click "Save" then click "View Live" to see your Houzz widget in action!